I admit it. I've been away from this blog for a little while. Part of it has been writer's block - ok, a good part of it - but also, I've been working on a project, a museum exhibition of art illustrating Ohio created before 1866. As you know, I try to tell visually compelling stories. And to do that, I need good images. Again and again I ran into the problem that I simply couldn't locate good material to illustrate the early history of this area. One thing led to another and I began a quest to locate all the art I could reasonably locate of Ohio views created before 1866. I thought there were, perhaps, a thousand such images. The first thousand came quickly. Then the second thousand. Right now, I'm closing in on 3,000. Many of them aren't that useful, but the point is that there's a great wealth of historic imagery, waiting to be used, if only it could be found. That's what I'm doing. While the art is always interesting, occasionally, I find something that excites me to no end. This was the case yesterday afternoon. Bass Island, West End of Lake Erie (1795) by Elizabeth Simcoe, after a drawing (1795) by Robert Pilkington. This watercolor painting, dating to 1795, is the earliest known painting of an Ohio landscape. I don't believe it's ever been reproduced in any work relating to Ohio history. How did I find this significant piece of our history? View on the Miami River (1794) by Elizabeth Simcoe, after a drawing (March, 1794) by Robert Pilkington. In Northwest Ohio Quarterly, I came across this drawing, View on the Miami River. Fortunately, the author noted the source for the image, The diary of Mrs. John Graves Simcoe, wife of the first lieutenant-governor of the province of Upper Canada, 1792-6 (1911) by J. Ross Robertson. After a bit of effort, I determined that Mrs. John Graves Simcoe did, in fact, have a name - Elizabeth Simcoe. As lieutenant governor, John Graves Simcoe travelled considerably. Elizabeth accompanied him. 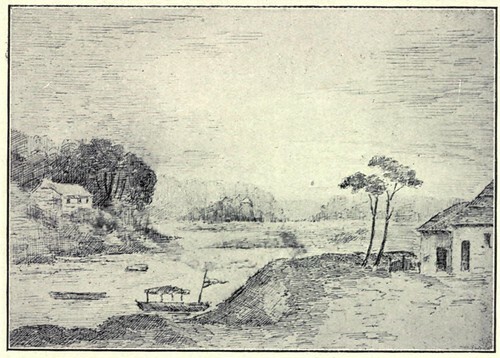 On these travels, she kept a diary and made many sketches, including this one, View on the Miami River (1794). The title confused me. The Simcoes travels were in Canada, almost exclusively. Elizabeth Simcoe's watercolors and drawings illustrate scenes along the Great Lakes and St. Lawrence River. While it was plausible that they might have travelled as far as perhaps the upper reaches of the Great Miami River, it seemed unlikely. Eventually, I broke down and gasp read the accompanying text, hoping to figure out where this was. The text indicates that the location was near Fort Miami. On reading further, it is noted that Miami and Maumee are variant spellings - Maumee being the one that remains in use today. The drawing above is of a scene likely in the vicinity of modern day Maumee, Ohio, in Lucas County. I worked for a summer on South Bass Island, so I have some idea of the lay of the land. I couldn't think of any place on the island, to the extent that I'd seen it, where this painting could have been made. That said, there's a good chunk of the north shore for which there is no public access - so it's not automatically a scene of Middle Bass Island or North Bass Island. I asked Roy Larick, historic geologist, of Bluestone Heights, if he had any ideas as to the location depicted. His eye for the historic landscape has often revealed things that I and many others have missed. Still, I was surprised when, a little more than an hour after I emailed him, this picture, of South Bass Island, showed up in my inbox. Roy Larick suggested that the view was "due east from Peach Orchard Point, across Put-in-Bay, to the north peninsula (monument location)." (As indicated by the arrow on the image.) He added "there are few other places where this configuration can be found in approximation with the painting distances." This painting is significant and deserves more research. If you find yourself on a boat in the area, consider taking a photograph from approximately the same position and sharing it here. 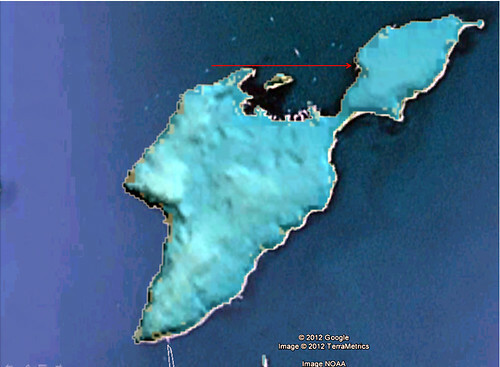 The painting of Bass Island is probably the north side of Gibralter Island, located just off Peach Point and in the Bay or possibly the west shore of South Bass. Those are the only two places with cliffs high enough. Thanks! I can't wait to see them! Email sent. I concur- glad to see you pop in!